October Release from Our Daily Bread Designs. My first project is made with the Diorama with Layers Dies. Christmas Card Scriptures, City Skyline, Cloud Borders, Bethlehem, Icicle Border, Trees and Deer, Snow Crystals, Holy Night and the Snowflake Season Paper Collection. It is hard to see those pretty clouds in these pictures! While the dioramas do take a little extra time to create, they come together quite easily! 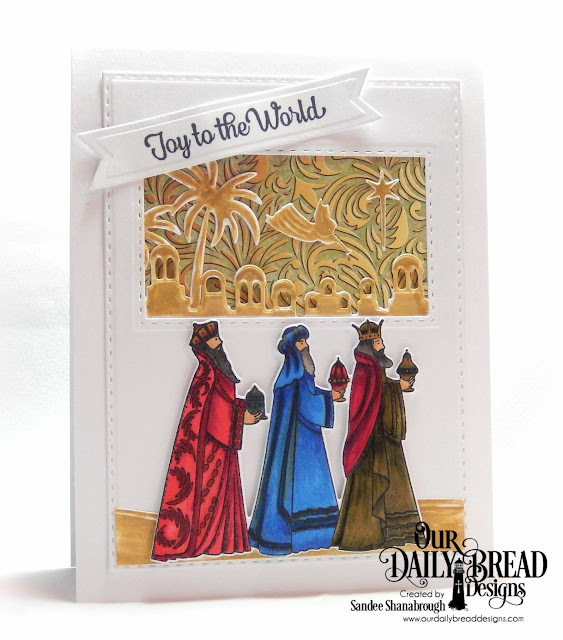 This card features the new Stamp/Die Duo called Great Joy. I colored the Three Wisemen with copics and then cut them out with the included die. I also used the following dies: Bethlehem, Holy Night, Double Stitched Rectangles, and Pennant Flags. The paper inside the window is from the Christmas Collection 2015 Pack. be sure to head over to the ODBD BLOG POST HERE.